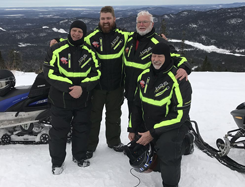 Join Ontario Snowcruises Ltd. for snowmobile tours in Ontario and Quebec, Canada with Canada’s most experienced, safest, and most knowledgeable tour operator. It’s the adventure of a lifetime. Based in Minesing, we ensure each cruise has a support vehicle available should the need arise. We travel throughout Ontario and Quebec, Canada, handling the lodging, food, and fuel stops for our clients. Each night includes a stay at a different motel or resort, and travel occurs throughout the day. Each group has a Guide in the lead, and a Sweep at the rear to ensure no one gets left behind. We transport your luggage for you, along with extra snowmobiles in case one breaks down. Our prices include all food and lodging throughout your snowmobile tours in Ontario and Quebec, ensuring an all-inclusive tour for you, your family and friends when you choose us. Join one of our planned trips or customize your own today with just a phone call! Our owner, Allan McFarlane, has been snowmobiling for more than 50 years. A passionate rider, he began touring with family and friends just over 25 years ago, which inspired us to establish the family business. 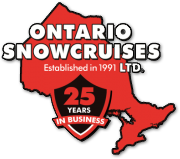 Today, Ontario Snowcruises Ltd. offers guided snowmobile tours throughout Ontario and Quebec, Canada. Our goal is to provide unique adventure tours that family and friends can all enjoy together, and to create the safest, most enjoyable, and simplest experience available. All tours begin with a welcome dinner, where we discuss our two big rules — be safe and have fun! Your Guide will ensure all road and rail crossings are safe, and your Guide will always accompany you for safety and to make sure no one gets lost. Our approach ensures that everything is worry-free — we've delivered plenty of tours since our inception in 1991. 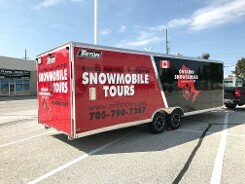 Thank you for your interest in Ontario Snowcruises, LTD and our guided snowmobile tours in Quebec and Ontario, Canada. Contact us at (705) 881-9867, today, to book your snowmobile adventure. We look forward to hearing from you soon. Snowmobile tours in Barrie ON, Huntsville ON, Cochrane ON, Gaspe QC, Saguenay, QC, and surrounding areas.